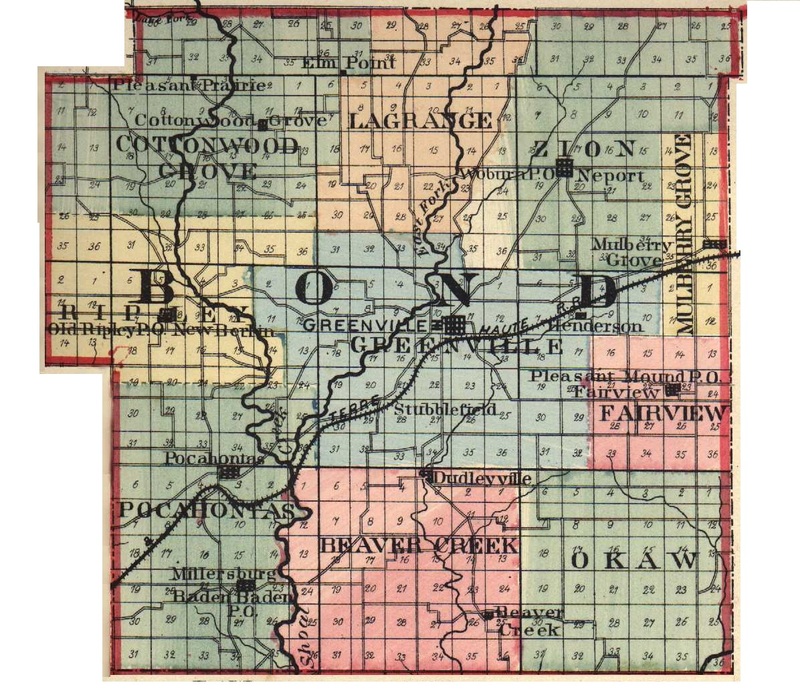 L. B. HUBBARD, one of the old settlers and prominent farmers of Bond County, resides on section 6, Pleasant Mound Township. He is descended from patriotic ancestors, and his father, Peter Hubbard, Sr., fought bravely on the side of the Colonists during the entire period of the Revolutionary War. He was a native of South Carolina and was there reared to manhood. After leaving home, he first settled in Tennessee and then came to Madison County, Ill., in the year 1809. Here he married Martha Gilham, who was also a native of South Carolina. In 1817 Mr. and Mrs. Hubbard moved into Bond County, where he took up sixteen hundred acres of Government land. He was obliged to go over into Madison County to get men to assist in raising his house, as he was one of the first settlers in the new county, and the largest land-holder. Here he remained until within one year of his death, which event occurred when he was eighty-seven. The death of his wife took place when she was sixty years of age, and the parents he buried on the old home place. Nine children were born to Mr. and Mrs. Hubbard, eight of whom grew to maturity. All of these but one were born in Bond County, Ill., and four of the family are still living, three of them in Bond County. Our subject is the fourth child and third son, and his birth occurred in Bond County, Ill., December 24, 1819. He was reared in his native place and his education was obtained in the pioneer log schoolhouse, where rough slabs served for seats, one small window admitted light, a stick chimney held the logs of firewood, and the door had wooden hinges, from which hung the proverbial latch string. Our subject remained with his parents assisting on the farm until his marriage, October 6, 1840, when he was united with Miss Sarah Grigg. This lady was born in North Carolina, April 14, 1821, and came to Bond County, Ill., with her father and mother when she was nine years old. The young married couple began their wedded life on a farm in Mulberry Grove Township, where the husband had entered two hundred acres of land. They remained there for about six years, and then moved to Fond du Lac County. Wis., where he engaged for about eight years in farming and lumbering. In 1856, he again changed his location and moved to Marion, Linn County, Iowa, where he remained for four years, but in 1860 he moved his family back to Bond County and located where he now resides. Mr. and Mrs. Hubbard were the parents of the following children: Francis M. died at the age of about twenty-two years; John II. resides in St. Louis; Elizabeth E. died at the age of thirteen years; George N., lives in Greenville; and Charles B. and William B. reside in Smithborough. Our subject-has a farm of one hundred and twenty-six acres and is now carrying on general farming. For many years he worked at his trade of a carpenter, and has done considerable building in Bond County, many houses and barns in that locality testifying to his skill in that line. Mr. Hubbard has been a stanch Republican since the formation of the party. He now lives one mile from the place where he was born, and he and his wife are one of four couples living in the same township who have been married over fifty years. Extracted 04 Dec 2016 by Norma Hass from 1892 Portrait and Biographical Record of Montgomery and Bond Counties, Illinois, pages 247-248.